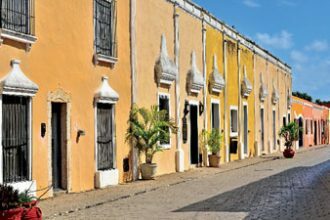 The ultimate way to stay fit while on vacation? Pack your bags for Southern California and get ready to sweat, soak up the sun and get your fitness in check. 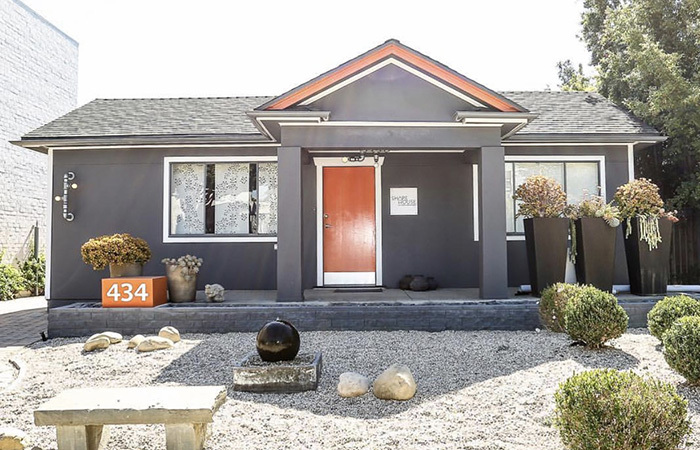 The SoCal life—sand between your toes, throwing on a pair of denim shorts and a bikini as your regular uniform—is laid back and easy-breezy, but having the healthy, fit body that all of the California babes seem to have? That comes from hard work. Thanks to the climate, being on the coast (and, yes, being the birthplace of many of the hottest fitness trends), the workouts aren’t all about being in a gym. Here are some of the top ways to work on your fitness should you be in Southern California (and if you have no immediate plans to travel to Cali, use this California dreaming as a way to inspire trying a similar sweat session in your hometown). We’d like to think you can prepare yourself for the twists and turns that life throws at you by practicing going every which direction in an aerial yoga class at Trilogy Yoga. And like in life, sometimes you just have to let go, and in this case, trust that the silks will support you. 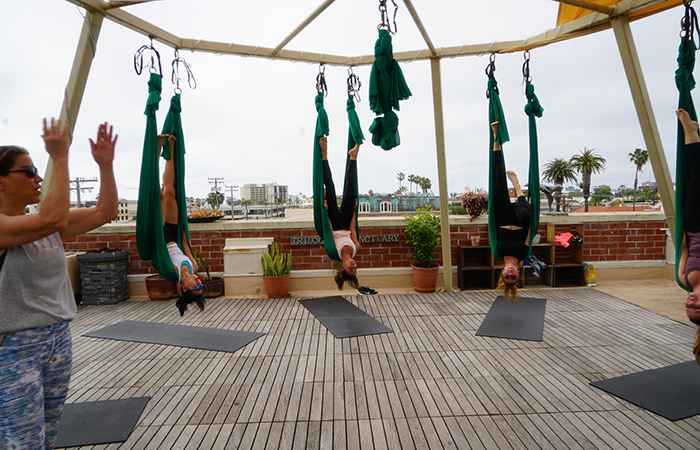 Held in a circle formation on a rooftop with beautiful views of San Diego, even our usual going-a-million-miles-a-minute brain managed to focus and be in the moment (possibly because we needed to ensure we didn’t tumble off of the aerial silks!) and got a fantastic flexibility workout. 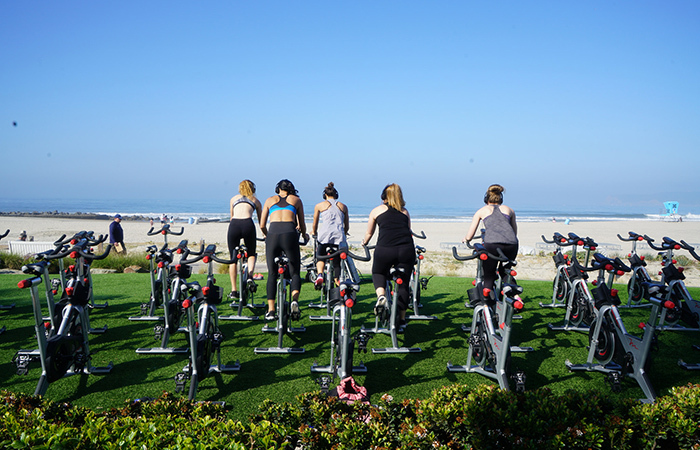 The whole nightclub atmosphere of many Spin studio classes is fun, but we are always seeking our vitamin sea, so the the beach Spin class at the historic Hotel del Coronado has our name all over it. With each bike set up with headphones, you get to discreetly listen to upbeat music while also hearing the instructor’s commands (“Turn that knob twice to the left!”) so as to not disturb everyone else on the beach, while you pump those legs on your Spin bike with a stunning view of the Pacific Ocean as the salty breeze cools you off. Rest and recovery is a key component of any healthy regimen. A multi-million dollar reno makes the 40-000 square-foot AquaVie Spa Wellness Club the place to do just that. If you need to fit in more fitness, there’s state of the art equipment, and both a running track and a Junior Olympic-size pool on the rooftop deck. To soothe your body, though, go for the sports massage to ease the tension in those sore muscles, and make time to include the upgrade of their fatigued leg treatment to boost circulation. 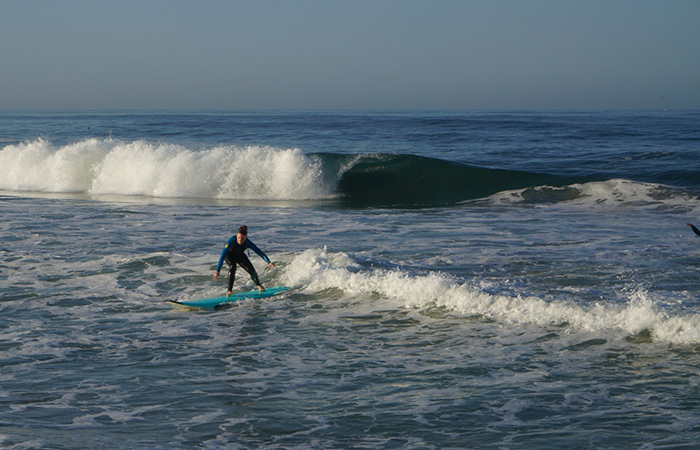 With consistent surf conditions year-round, Huntington Beach is a the spot in Southern California to catch a wave for both newbies and pros alike. If you’re new to the sport, book a lesson with the dudes from Toes on the Nose (you’ll find the shop on the Hyatt Regency property) as they are pros at teaching beginners. You may find doing sun salutations and tree pose more challenging than usual when you have sand shifting beneath your feet, but the sounds and view of the ocean more than make up for taking your practice to Huntington Beach. Toes on the Nose offers classes you can book, and they provide the mats, so you can concentrate solely on improving your ujayi breath. Put on a life jacket and helmet and set out for a kayak excursion with Everyday California in La Jolla that, conditions permitting, will take you into caves (the conditions were too rough for us on our day out to explore them). If you’re blessed with big waves like we were, you’ll have to surf that kayak on a wave to get back to the shore, which is exhilarating, and in our case, very very wet (yes, we flipped our kayak). The hottest way to work up a sweat in SoCal (celebs including Selena Gomez are reportedly fans) is a session at Shapehouse. Dubbed an urban sweat lodge, here you get tucked into a padded infrared heated foil blanket, which reaches a temp of 75 Celsius. Catch up on TV as you lay there and sweat for 55 minutes; a session they say will burn up to 1,600 calories for the 36 hours that follow. The benefits promised? Better sleep, weight loss and detoxing the body, to name just a few.